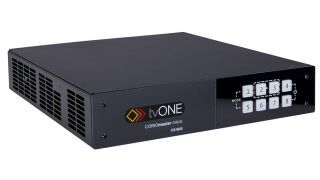 The What: tvONE has added the CORIOmaster micro to its CORIOmaster video processing product range. The What Else: CORIOmaster systems, which consist of the CORIOmaster (4RU), CORIOmaster mini (1RU), and new CORIOmaster micro (1/2 RU), are designed to provide powerful, creative video processing. The modular I/O system provides the flexibility of any signal in, to any signal out, and can manage up to four canvases for supporting multiple video walls, while also performing various other video tasks simultaneously, including real-time 360 video rotations, multi-image processing, and transitions and edge blending. The new CORIOmaster micro half-rack unit delivers the same bandwidth and functionality of CORIOmaster in a more compact form that is capable of accepting up to three modules, and also adds audio support as well as front-panel buttons for source routing and preset recalling. Paired with the design software CORIOgrapher v2, usability is designed to be straightforward and intuitive. CORIOgrapher allows users to set the exact dimensions of displays down to the inch, millimeter, or even pixel. The Bottom Line: CORIOmaster micro is specifically engineered for four-screen, 2x2 video walls, projector edge blends, and small multiviewer applications that don’t require a full-sized CORIOmaster.